Chickenpox is often considered a fairly harmless disease. Many parents, and even some medical professionals, may view the disease as a childhood rite of passage. However, before the varicella vaccine was routinely given, chickenpox infections resulted in over 10,000 hospitalizations and 100–150 deaths each year in the United States alone. That’s about two or three deaths a week! The older you get, the more risk there is of complications from chickenpox. It is not better to get chickenpox naturally. The potential risks of the disease are severe and no one can predict which child will develop a life-threatening case of chickenpox. Shingles is a complication of “natural” chickenpox. Chickenpox is caused by the varicella virus and was once a common childhood disease. It is usually mild but it can be serious, especially in young infants and adults. The varicella virus causes rash, itching, fever and tiredness. Severe complications are rare but do occur and include: skin infection, scars, pneumonia, brain damage or death. Chickenpox is highly contagious. It is an airborne disease. The virus spreads through the air when an infected person coughs or sneezes, or by touching chickenpox lesions (sores). 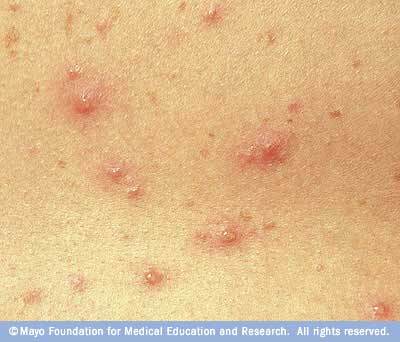 A person with chickenpox is contagious from 1–2 days before rash onset until the lesions have crusted over. It takes from 10–21 days after exposure to the virus for someone to develop chickenpox. Centers for Disease Control and Prevention (CDC) studies state that 90% of the susceptible people (i.e. those unvaccinated) in a house with an infected person will also become infected with chickenpox. Most often chickenpox lesions are concentrated on the trunk, with fewer lesions on the arms and legs. If you see lesions or vesicles on the palms, soles and oral cavity, it may suggest hand, foot and mouth disease. A person who has had chickenpox can get a painful rash called shingles years later. See below for more information on shingles and chickenpox. The varicella vaccine is a live attenuated vaccine; meaning the actual virus is still alive but has been altered so that it is very unlikely to cause an infection. However, it will still trick the immune system into building up antibodies against it. It was licensed for use in 1995. CDC recommends two doses of chickenpox vaccine for children, adolescents and adults. Two doses of the vaccine (usually age 1 and 4) are about 88–98% effective at preventing all chickenpox. A vaccine, like any medicine, is capable of causing serious problems, such as severe allergic reactions. The risk of the chickenpox vaccine causing serious harm, or even death, is extremely small. Getting chickenpox vaccine is much safer than getting the chickenpox disease. Most people who get chickenpox vaccine do not have any problems with it. Reactions are usually more likely after the first dose than after the second. Other serious problems, including severe brain reactions (encephalitis) and low blood count, have been reported after chickenpox vaccination. These happen so rarely experts cannot tell whether they are caused by the vaccine or not. Encephalitis and low blood counts can also occur with a natural case of chickenpox. Note: The first dose of measles, mumps, rubella and varicella (MMRV) vaccine has been associated with rash and higher rates of fever than MMR and varicella vaccines given separately. Rash has been reported in about 1 person in 20 and fever in about 1 person in 5. Seizures caused by a fever are also reported more often after MMRV. These usually occur 5 to 12 days after the first dose. (CDC) Parents may choose this option in order to reduce the number of injections their child gets or get the MMR and varicella separately. The varicella zoster virus (VZV) causes two distinct diseases. Chickenpox (varicella) is one and commonly occurs in children. Many years later the virus can reactivate to cause Herpes Zoster, often called shingles. It is a painful rash on one side of the body and most commonly occurs in adults. In other words, the same virus that caused chickenpox when we were young stays dormant in our nerve cells. What causes a reactivation of the virus is unclear. However, what does seem to be clear is that as we age, the immune responses that keep varicella zoster virus dormant weaken. About 1 in 3 people will get shingles during their lifetime, and at least half of all people 85 and older will. One of the many perks of living longer. Immune-suppressed people, such as those with cancer or HIV, are at higher risk for shingles. Shingles cases have been on the rise for at least a decade in the US. One popular theory behind this rise is the increase in chickenpox vaccinations of children. Because most children no longer get chickenpox, their parents no longer get the immunological boost that comes from being exposed to the virus when their children are infected. Although it is widely repeated, there are a few reasons to doubt this theory. First, studies (see references below) have found that shingles was on the rise even before the chickenpox vaccine was licensed for children in 1995. Secondly, adults in states with mandatory chickenpox immunization didn’t have higher rates of shingles than those in states where children weren’t as well vaccinated, and therefore more likely to get sick and provide immune boosters to parents and grandparents. Finally, as the population in the U.S. gets older, more people will eventually get shingles. There are still a lot of unanswered questions and unknowns. Researchers don’t know if the two doses given during childhood will be enough to protect them against shingles when they are older adults. The vaccine hasn’t been around long enough to determine that. The good news is that adults ages 60 and older, whether or not they had chickenpox as a child, can be vaccinated against shingles. So, what’s the upside? If you didn’t get wild type (natural infection) chickenpox as a young child (you were vaccinated), you probably won’t get shingles as an adult. But the jury is still out on that. Meanwhile, we do know the varicella vaccine is safe. Is the US the only country routinely vaccinating healthy kids for chickenpox? While the varicella vaccine is not routinely given in many countries, it is used to vaccinate healthy children in the following countries: United States, Australia, Canada, Costa Rica, Germany, Greece, Korea, Qatar, Saudi Arabia, Spain, Switzerland, United Arab Emirates and Uruguay. If you are traveling with young children, or an older child who has not been immunized, consider vaccination prior to traveling since chickenpox is still common in many countries. Interestingly, countries in Europe who do not vaccinate for chickenpox have done cost-benefit analysis on the issue. For example, while Belgium still does not include varicella in their vaccine schedule, scientific studies there indicate it would be beneficial for their medical system to do so. The pox party is not an urban myth and, on a certain level, it makes sense. Why not attempt to control the inevitable since chickenpox is such a “harmless” disease? Unfortunately, there is simply no way to predict the outcome of a natural infection (wild type) of chickenpox. We forget that before the vaccine there were 10,000 hospitalizations a year due to chickenpox. There is also no way to guarantee that your child has acquired chickenpox until you see the rash, so you could unwittingly expose pregnant women, immune-compromised children and the elderly in the meantime. (Barbara Walters was 83 when she was hospitalized for chickenpox.) With natural chickenpox you are contagious—with the vaccine you are not. So, the question is why? Why, when a safe vaccine exists, would we not vaccinate? We know pox diseases can be eradicated, so why not start that process with our generation of children. But let’s take a big, community-wide view of this issue. Who are the promoters of chickenpox parties? Are they middle and upper middle class stay-at-home moms? Is it because they can afford to stay at home with sick children for extended periods of time? In our society the burden (so to speak) of chickenpox is not equitably distributed. Even uncomplicated cases of chickenpox cause children to miss a week or more of school, with a caregiver also missing work to care for the sick child. That means low-income families and single-parent families are more likely to suffer economic and educational setbacks from a bout or bouts of chickenpox in the household. Imagine the family with three children who all get chickenpox, one after the other. A parent could potentially miss more than three weeks of work, which may have serious consequences for a family with no safety net. Centers for Disease Control and Prevention. Varicella outbreak among vaccinated children: Nebraska, 2004. MMWR Morb Mortal Wkly Rep.2006;55 :749-752. Davis MM, Patel MS, Gebremariam A. Decline in varicella-related hospitalizations and expenditures for children and adults after introduction of varicella vaccine in the United States. Pediatrics.2004;114 :786-792. Department of Pediatrics, Columbia University College of Physicians and Surgeons Human Herpesviruses: Biology, Therapy, and Immunoprophylaxis. Varicella-zoster vaccine Anne A. Gershon., New York, NY, USA. Leung J, Harpaz R, Molinari NA, Jumaan A, Zhou F. Herpes zoster incidence among insured persons in the United States, 1993–2006: evaluation of impact of varicella vaccination. Clin Infect Dis. 2011 Feb 1;52(3):332-40. U.S. Department of Health ＆ Human Services Centers for Disease Control and Prevention: Vaccine Information Statement.